Google started rolling out its new user interface for Gmail late last year. Soon, Google will migrate even those users who have, until now, resisted this change to the new design. Not everybody is in love with the new design, of course, so it doesn’t come as a surprise that a little cottage industry of new Gmail enhancement tools has cropped up over the last few months. Thanks to browser extensions like Gmelius, which came out of beta today, you can reclaim some of your sanity – and screen estate – once you switch over to the new design. 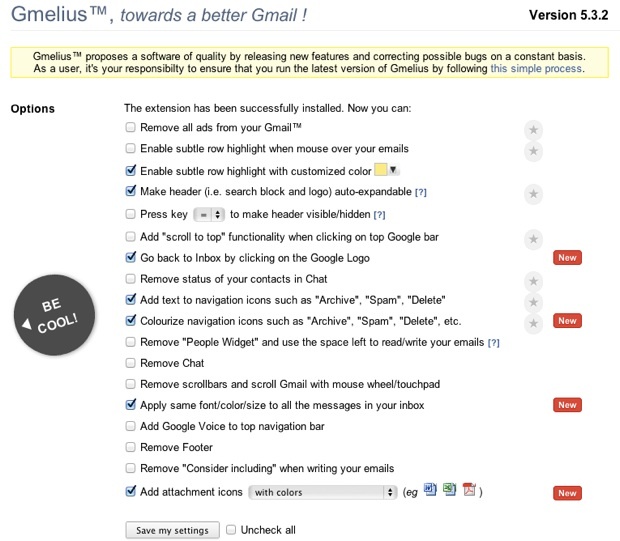 Among Gmelius’ most useful features are the ability to customize Gmail’s navigation icons to show both text and icons, for example, as well as tools to remove Google’s people widget and Google chat from your inbox. Gmelius is available for Chrome, Firefox and Opera. If you have friends or colleagues who like to write their emails in Comic Sans, you can also tell Gmelius’ to homogenize the look and feel of all your incoming messages based on the default Gmail settings. Other useful changes Gmelius makes to your Gmail inbox include the ability to pin a link to Google Voice to the top navigation bar and add subtle row highlights when you mouse-over your emails. In addition, you can use the tool to remove all ads from Gmail. One nice aspect of the extension is that you can choose which of these features you would like to turn on or off. You can download the extension here.